Jeu de piste spécial Singa ! Du 30 janvier au 7 février, 63 affiches Singa seront cachées dans toute la ville de Lyon. Pour l’occasion, nous t’invitons à devenir détective Singa ! Trouver les affiches: seul ou en groupe. 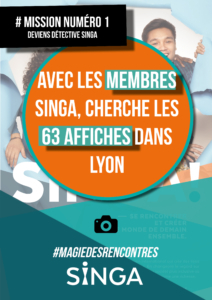 Te prendre en photo devant et la poster sur le Groupe Facebook de Singa Lyon en nous précisant l’emplacement de l’affiche. Diffuser la campagne au maximum auprès de tes proches et des autres membres Singa. Objectif final : Trouver l’emplacement des 63 affiches avant la fin de la semaine. Alors ? Vous êtes partant.e.s ? Here is the last exclusive SINGA news ! 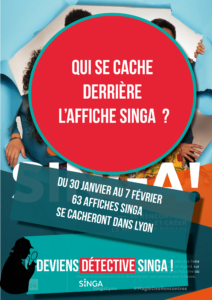 From 30th january to 7th february, the posters advertising of SINGA are going to be spread all over Lyon. Let’s see who is the best detective ! The most important step of this magical and secret recipe is to take a picture with the advertisement poster. At this point, dear detective, you have to post the picture that you took on « Groupe Singa Lyon » and you should mention the areas name where you found it. As the last step, you should do a tag to your friends, and people you know from SINGA on facebook, so they can do the same. The aim of all this, is to find the 63 advertisings before it ends ! We can create a new world together. وايضا لنرى من لديه حس التحري و الاكتشاف و البحث عن الحقيقة .. اوه لا لا اقصد البحث عن اعلانات Singa . 4. كخطوة اخيرة عليك ان تقوم ب تاغ لأصدقائك و معارفك الذين تعرفت عليهم من خلال Singa ليشاركوك الاكتشاف. اتمنى منكم الاحتفاظ بهذه الوصفة السرية لأنفسكم وعدم البوح بسرنا لأحد. لتقديم المساعدة لأكبر عدد من الناس يتحتم علينا التحدث عن Singa لجميع معارفنا و أصدقائنا ليطلعوا على عمل الجمعية و بدورهم يقدمون المساعدة التي يستطيعون عليها.